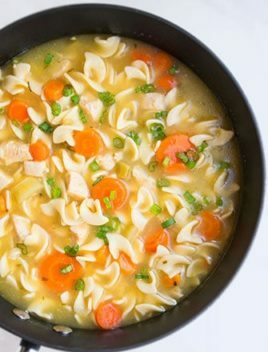 Quick and easy homemade chicken noodle soup recipe from scratch that’s made in just one pot with simple ingredients. It’s light, healthy, cheap and delicious and ready in 30 minutes on stovetop! This soup is perfect for a weeknight dinner or lunch and just as good as this Crockpot Chicken Noodle Soup. It’s especially helpful if you’re not feeling well or have a nasty cold. I know there are so many recipes and variations out there but this is the way my Mom and Grandma make it and it’s seriously the BEST homemade chicken noodle soup ever! You can serve with bread or crackers but it’s a truly a meal on its own! Use an already cooked rotisserie chicken to help speed up the process and make a rotisserie chicken noodle soup. Leftovers can easily be enjoyed the next day for lunch or dinner. Adjust the amount of vegetables and spices, based on your preference. If you’re using a crockpot – use a crockpot liner bag to make clean up easy and simple! I like to use chicken broth but you can use vegetable broth too. Use LOW SODIUM chicken broth or else the soup will become very salty. Any type of noodles can be used but egg noodles taste the best. How do you make Chinese Chicken Noodle Soup? This Healthy Homemade Chicken Noodle Soup can also be made into a Chinese Chicken Noodle Soup. I do this by adding in 1-2 tablespoons of light soy sauce to taste and then add in 4 oz of dried Chinese noodles instead of the egg noodles. I also only include the garlic cloves, ginger and onion vs. the other vegetables. You can also try adding in sriracha sauce and using green onions instead of white ones. How can I make a quick chicken soup? My recipe below is super quick. You can use leftover chicken that’s already cooked or rotisserie chicken, frozen vegetables or vegetables that you have chopped up prior, some basic herbs and spices. How do I make a creamy chicken noodle soup? 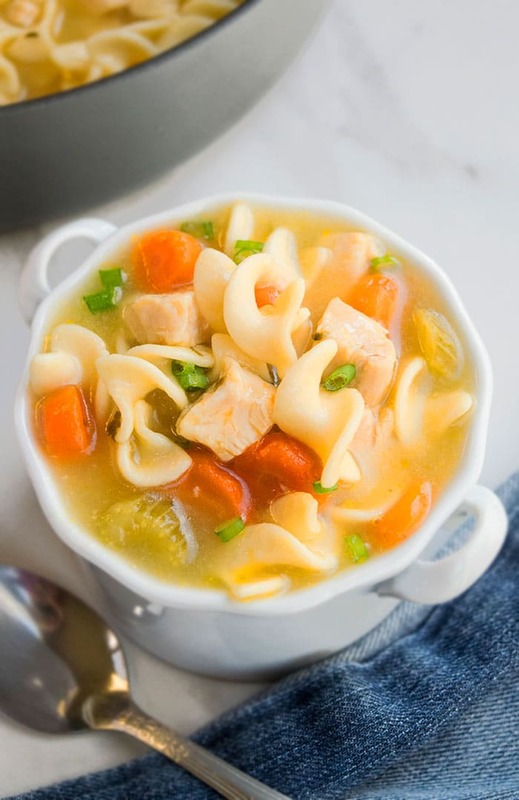 You can thicken up this classic chicken noodle soup by adding a ¼ cup of butter, a 1/3 cup of cream, a ¼ cup + 2 Tbsp all-purpose flour and 2 ½ cups milk. After you have prepared the soup, according to the instructions below, you will melt butter in a saucepan over medium heat. Add flour and cook for a few minutes, while stirring constantly. While you’re whisking slowly, add in the milk and whisk to smooth consistency. Then whisk in the cream and bring mixture to a boil, stirring constantly. Pour this milk mixture into soup mixture and stir. What is in homemade chicken noodle soup? Besides the chicken and the noodles, you will also find parsley, salt and pepper, a variety of spices like bay leaf, oregano, thyme, and ginger. There is also chicken broth, butter, carrots, celery and onions that make up this delicious hearty meal. Yes, it can be frozen in tight sealed containers for up to 1 month. 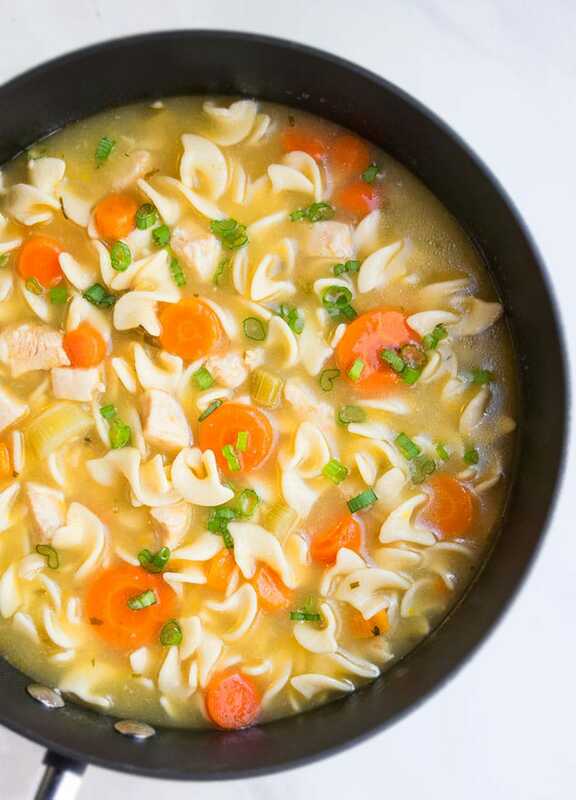 What spices do you add to chicken noodle soup? Bringing out the flavors and aromas of this easy soup are the spices of salt, pepper, bay leaf, oregano, thyme, parsley, ginger and garlic. How do you thicken chicken noodle soup? You can use all-purpose flour or cornstarch to do this. Add 2 tbsp all-purpose flour and 1/4 cup cold water (for each cup of soup). Mix the flour and water together until a thick mixture forms. Remove any lumps by crushing them with the back of a spoon. Add the mixture to the soup and simmer for 3-4 minutes or until it thickens. 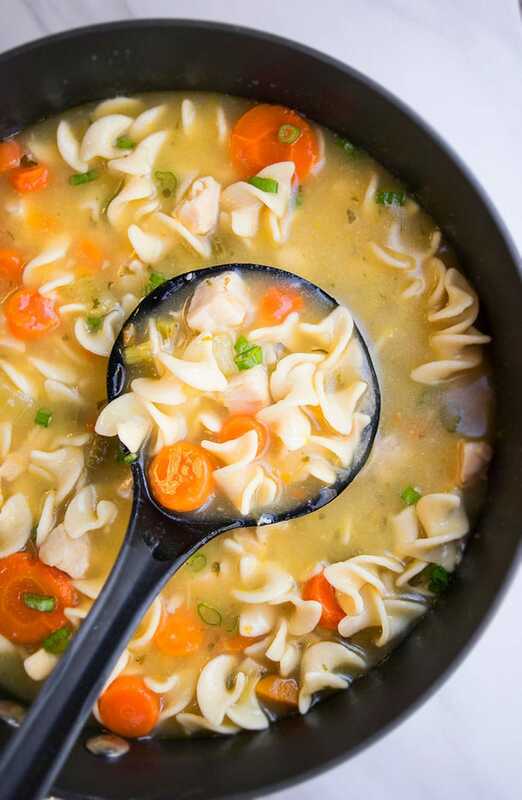 Quick and easy homemade chicken noodle soup recipe from scratch that's made in just one pot with simple ingredients. It's light, healthy, cheap and delicious and ready in 30 minutes! In a large stockpot, heat butter on medium high heat. Add carrots, celery, onions and saute everything until the veggies become slightly tender. Add ginger, garlic and saute them for 1-2 minutes, making sure not to burn them. Check the flavor to see if you need to add morel herbs or spices and add accordingly. Discard the bay leaf and garnish with some fresh parsley or thyme or green onions and enjoy! Everyone in my family requests this soup when they’re feeling down. It’s so good! This looks so hearty and delicious! I need to make this ASAP! A great chicken noodle soup is a must to have in your recipe collection… this is the best one! This looks really comforting! Perfect any night of the week! i can just smell this soup cooking!! perfect all year long! This soup looks absolutely perfect! this looks seriously cozy! can’t wait to try it!